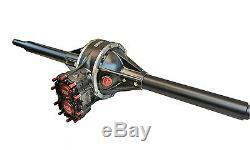 PEM Black Dirt Late Model Quick Change Rear End Bare with REM Finishing of all Internals with Aluminum wide 5 Tubes SPECIFY WIDTH AND OFFSET NEEDED OR AXLE LENGTHS YOU USE IN QUICK CHANGE. Track Proven for 4 years FEATURES. Black Thermal Coating of inside and outside of center & bells. REM Finishing of ring & pinion, bearings and races for reduced friction and heat. Drilled Aluminum Spool for reduced rotating weight. Black Anodized Aluminum wide 5 Tubes. Magnesium / Aluminum Alloy Castings. Posi Locking Nut on Pinion. OPTIONS AVAILABLE Lightened Ring Gear - 9" OD for Crate Engine or 9.5" OD for Limited Engines. Billet Big bearing Black Rear Cover Build time is 5-7 days after order is received. WARNING: Cancer And Reproductive Harm. The item "PEM Black Dirt Late Model QC Rear End Bare with REM Finishing of Internals" is in sale since Monday, January 21, 2019. This item is in the category "eBay Motors\Parts & Accessories\Performance & Racing Parts\Dirt Oval Racing Parts\Late Models". The seller is "pemracing" and is located in Saint Clair, Missouri. This item can be shipped to United States.